EIB also signed a declaration with the government to support economic and social development projects. 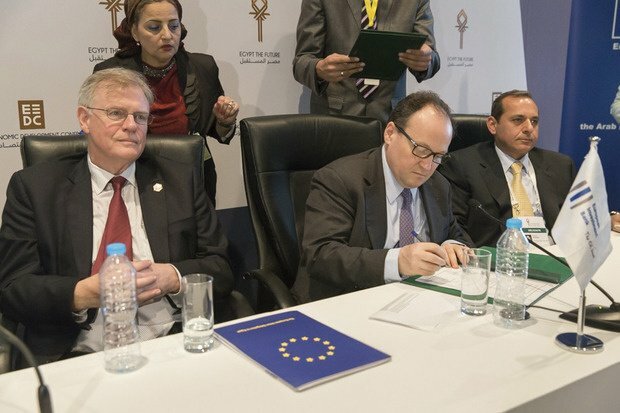 On the sidelines of the Economic Development Conference in Sharm El-Sheikh, The European Investment Bank (EIB) signed a € 120 million loan with the National Bank of Egypt (NBE) to finance private sector companies. The loan is dedicated to financing small and medium-sized enterprises (SMEs) who are carrying projects in production and service sectors; the move aims to bolster production and competitiveness in Egypt while responding to the need for creating jobs in Egypt. The loan will increase NBE's ability to improve SME'S access to credit in the form of long-term loans denominated in EUR and USD to support import and export transactions. This financing helps forward the vision of both Egypt and the European Union towards the development of a market economy to encourage investments and trading at the national and international levels. “It is a real pleasure to sign such a contract for supporting SMEs during my first visit to Egypt on behalf of the European Investment Bank. Through this financing and as a key financing partner of Egypt, EIB’s objective is to support the social and economic transition by promoting SMEs, development and competitiveness. With this support, we will encourage job creation, especially for the younger generation”, said EIB Vice-President Ambroise Fayolle during the signing ceremony. 1) improving socioeconomic infrastructure in the sectors of energy, transport, water, wastewater and waste disposal, urban development, public-private partnerships, and information and communication technologies. 2) supporting the development of the private sector in the fields of industry, foreign direct investment and micro, small and medium-sized enterprises. EIB already identified several projects that it can support with financing in excess of 2 billion Euros in the fields of energy, transport, water, banking and industry. EIB stated its commitment to provide guarantee provisions and favorable operational conditions. EIB had started its operation in Egypt in 1979 and financed over 90 projects worth 6.3 billion Euros (in loans and private equity) in private and public sectors. The total investment value reached over €20 billion.